The Birth of Italy The Institutionalization of Italy as a Region, 3rd-1st Century BCE | Free eBooks Download - EBOOKEE! Filippo Carla-Uhink, "The Birth of Italy: The Institutionalization of Italy as a Region, 3rd-1st Century BCE"
Scholarship has widely debated the question about the existence of an 'Italian identity' in the time of the Roman Republic, basing on the few sources available and on the outcomes of the Augustan and imperial age. In this sense, this debate has for a long time been conducted without sufficient imput from social sciences, and particularly from social geography, which has developed methodologies and models for the investigation of identities. This book starts therefore from the consideration that Italy came to be, by the end of the Republic, a region within the Roman imperium, and investigates the ways this happened and its consequences on the local populations and their identity structures. It shows that Italy gained a territorial and symbolic shape, and own institutions defining it as a territorial region, and that a regional identity developed as a consequence by the 2nd century BCE. The original, interdisciplinary approach to the matter allows a consistent revision of the ancient sources and sheds now light on the topic, providing important reflections for future studies on the subject. 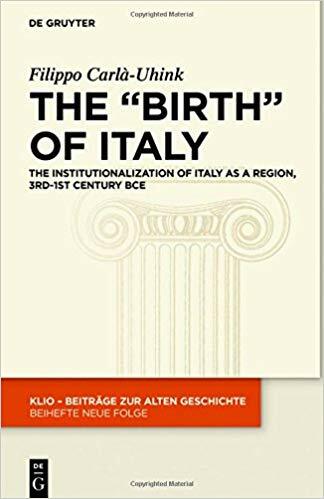 No comments for "The Birth of Italy The Institutionalization of Italy as a Region, 3rd-1st Century BCE".